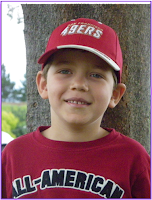 Michael is a sweet, fun-loving, 5-year-old boy who has attended the San Jose Scottish Rite Childhood Language Disorders Clinic since August 2010 due to a mild articulation disorder. Michael’s parents initially brought him to our clinic because they were concerned about his articulation skills and possible word-finding issues. His parents were also concerned about Michael’s lack of confidence in his speech and that he did not speak up for himself at school. Assessment of Michael’s speech and language skills found that he produced his /s/ and /z/ sounds with a fronted tongue position. Language testing found that he did not have word-finding difficulty. Since the initiation of treatment, Michael has made tremendous gains. In the beginning it was very difficult for Michael to produce /s/ in isolation without significantly protruding his tongue between his teeth. However, a program called “Straight Speech” helped Michael learn correct tongue and jaw placement for /s/ using straws and specified target words. Michael has now mastered /s/ in isolation and is now producing /s/ in his own sentences at the beginning and ends of words! He is even making progress with /s/ in consonant clusters such as “spoon” and “smart”.